The following content was provided by Did You Know, by Scholastica (Gay) Cororaton, Research Economist, on July 31, 2014. REALTORS® generally expect home prices to increase in all states and the District of Columbia over the next 12 months, according to the June 2014 REALTORS® Confidence Index. 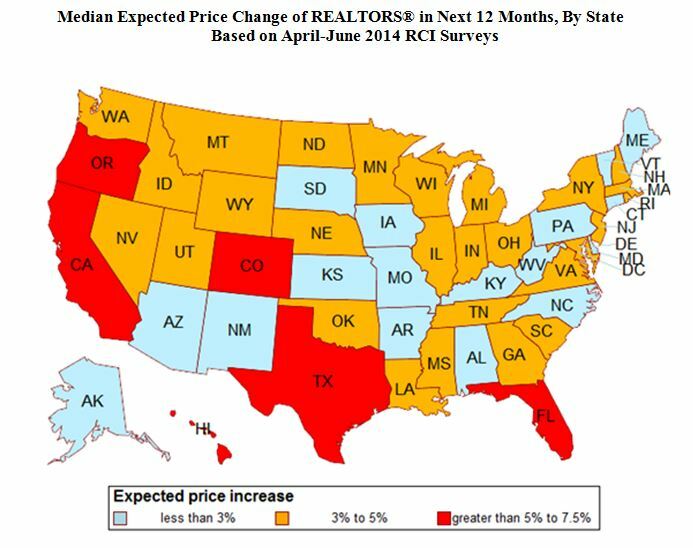 The median expected price increase is 3.6 percent . Expected price movements depend on local conditions relating to housing demand and supply, demographics, and job growth. For more information on Hawaii’s real estate market contact a local REALTOR®. The median expected price change is the value such that 50 percent of respondents expect prices to change above this value and 50 percent of respondents expect prices to change below this value. A median expected price change is computed for each state based on the respondents for that state. The graph shows the range of these state median expected price changes. To increase sample size, the data is averaged from the last three survey months. Hawaii Dream Realty LLC offers full service property management for Oahu real property owners who wish to retain their investments, increase property value and maximize their return. Many investors are already accustomed to managing accounts online, checking balances, making online payments, and electronically transferring funds. Our approach to investment properties is the same which is why we employ an easy to navigate, Real Property Investment Management Portal. The portal provides the level of transparency into our property management that you deserve and benefit. For Property Owners, we offer two levels of property management service: full management service and limited management service. 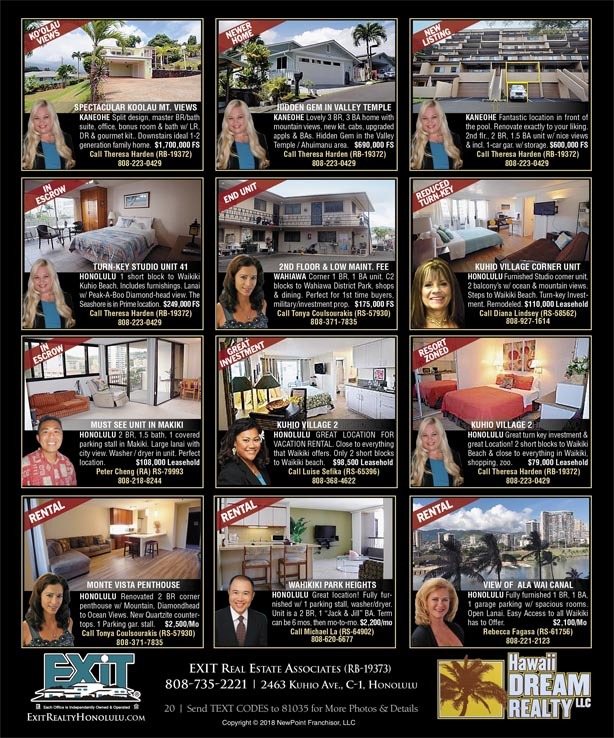 Since EXIT Hawaii Dream Realty is a licensed and insured, full service, residential real estate brokerage, if you are interested in selling your real estate, we can work with you to maintain your rental cash flow while discretely marketing the property for sale. Full Management Service includes access to our Real Property Investment Management Portal which enables you to log into a secure web site with real time access to property information. The portal is the link between your real property portfolio and our property management accounting system. You have on-demand, real time, access, where ever or whenever you have Internet access with complete transparency into our accounting. This means you can view Owner Rental Statements with the ability to point and click to retrieve transaction details or ledger entries. The portal also provides a means to update contact information; view, track, or defer work order requests; access shared documents; and generate financial, rental, and task reports. If you need advice on short term or long term investment property cash flow or if you are interested in our property management service, call us at (808) 735-2221, or visit our Honolulu office. We look forward to the opportunity to exceeding your expectations and serving you with professional real estate investment marketing, sales, and management services. “A Hui Hou” (until we meet again). 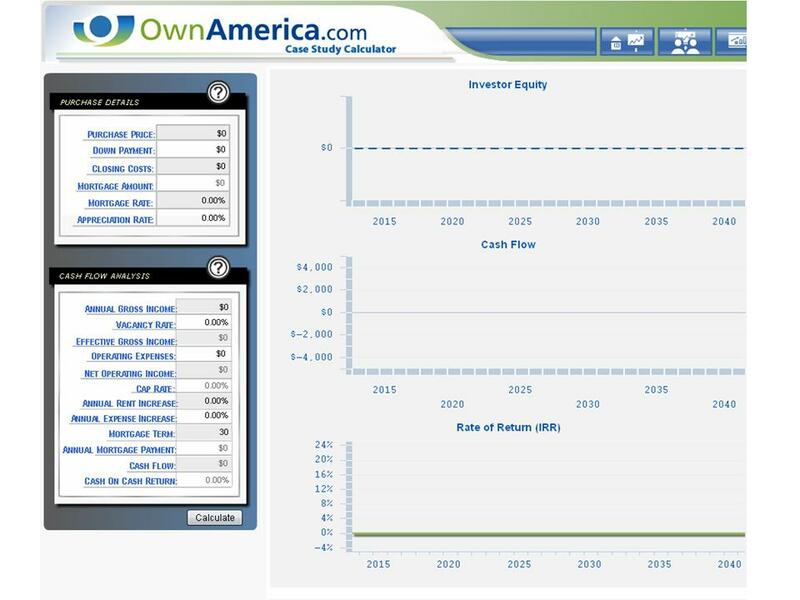 OwnAmerica’s Case Study Calculator is a tool that enables you to quickly and easily calculate the cash flow, cap rate, and rate of return on a cash flow property. Experiment with projections for changes in property appreciation, rental cash flow and property expenses, and see graphically how these changes can affect this real estate investment over the long haul.